Haul! Boots, Jeans, and E.L.F. Happy Saturday Senoritas and Senoritos! Anyhoo, I did a little shopping a few days ago and I got some pretty neat stuff. 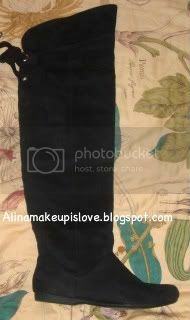 I was really craving some over-the knee boots, and I figured that I would never find a pair because most of the boots these days are pull-ons and the problem with me is that my calves are really thick (thick and fab!) and most of the pull-on boots dont go past them, so I gave up hope. Until...I stopped by my local famous footwear store (which is an awesome store by the way) and I spotted these amazing faux-suade over-the knee boots by Fergie's shoe brand-Fergalicious. Famous Footwear was having discounts on boots upto 50% (I think they are still having it, I am not sure) and originally the boots were $80, but with the discount they came up to $54.99! What a steal. These boots are amazing. Not only are they comfy, but they have a zipper which makes it so easy for me to put them on and they fit over my calves! YAY! They are spacious over-the knee and it looks very flattering. I also love the bow tie in the back. 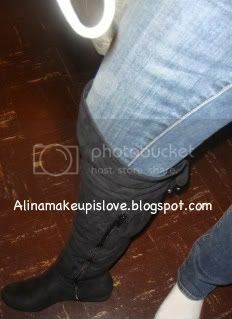 These boots look so chick and fashionable. I wore them with leggings yesterday and a dress and it was adorable. These boots look amazing with jeans as well. 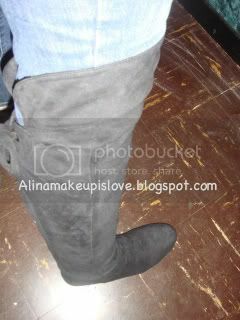 I am definitley going to rock these boots a lot this winter. Here is the link to these boots, from the famous footwear website. Click here to be directed. Such an adorable shoe box! 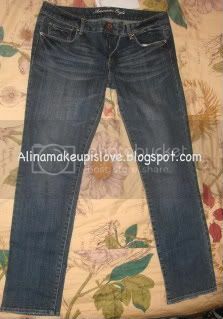 I also stopped by American Eagle and snagged up these cute skinny jeans for only $30! Lastly, I stopped by a beauty supply store and picked up 2 E.L.F. products. 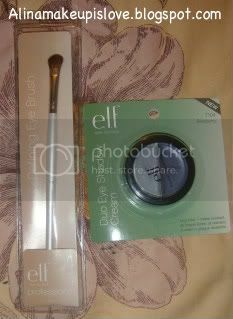 I got a defining eye brush, and a cream eyeshadow duo in Blueberry. I cant wait to do looks with it! Like this stuff? Does anything stand out to you? Let me know in the comments! Disclosure: I bought all these products on my own. I am not affiliated with any of the companies mentioned above. @Courtney-They are really cute! They fit really nice too.